Feature: Morphite Devs Explain Why It's Much More Than Just "No Man's Sky On Switch"
"Everyone has a soft spot for Nintendo"
Sci-Fi adventure Morphite is one indie title that has been on our radar ever since it was first confirmed as coming to the Switch, and with good reason - it aims to combine the likes of Metroid Prime and Turok, and has been compared to No Man's Sky for its striking, low-poly visual style. Those of you with long memories will recall that Morphite was supposed to launch on the Switch earlier this month, but sadly that hasn't been the case. According to Blowfish Studios co-founder Ben Lee, the team have one remaining issue to tackle before the title can pass Lotcheck, but the good news is that we should still get to experience this appealing adventure before the end of the year. Despite the disappointment of Morphite missing its Switch release, we're still very excited about playing it - and we were lucky enough to sit down with Lee and Crescent Moon Games founder Josh Presseisen to talk about this collaborative effort. Nintendo Life: First of all, congratulations on the upcoming release of Morphite on Nintendo Switch. Ben Lee: Thank you! It’s certainly been a rough ride considering it’s our first Switch release. How has the development process been on Switch? Ben Lee: Development for the Switch has been enjoyable! Compared to the Wii U we have found the support from Unity for the Switch to be really great. Also, Nintendo’s development tools and platform is much improved. There was one issue we discovered, but Nintendo were very apologetic about it. Ben Lee: We started porting Morphite and optimising it for the Switch in June 2017. What attracted you to develop for Switch? Ben Lee: Everyone has a soft spot for Nintendo and we’d tried to get our previous games on to the Wii U without much luck. We are a registered Nintendo developer, but the porting process for Wii U just had too many issues that we couldn’t resolve. When we heard about the Switch and its hardware specification we knew we had a much better chance to get our games there. The fans of Nintendo also seem a lot more vocal and friendly, so we really wanted to succeed in getting a game released for them, too. What was your exposure and interest to the rumours of the 'NX'? Ben Lee: We actually heard about the hardware specs and release estimates back at the end of 2015, so we kind of knew how correct the rumours were. It must be exciting to launch on a new platform that has huge popularity at the moment, despite its relative infancy? Ben Lee: Yes, plus the Switch is quite unique with its controls and being able to be played on the go, so it has some special challenges. Was there a particular aspect of the game that was the focus or did everything come together organically? Josh Pressesien: When we started out, we had been working on another low-poly styled game, and then this idea sprung up. It seemed to lend itself well to Sci-fi, so we went with it. I think even though low-poly is quite popular now, it still maintains a unique look, somehow. What were your influences during the transition from playing games to starting on Morphite, and how long has it been in development? Josh Pressesien: I've been playing games ever since I was 5 years old, but started making games as recently as 2009. 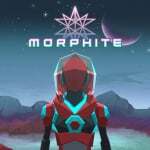 Morphite has been in development for roughly a year and a half. What's the gameplay balance like between exploration, resource management and platforming? Josh Pressesien: Most of the game is really focused on the main storyline, which does contain a lot of the platforming. There are areas on the random worlds where you can also platform, and use some of the special tools you find during the story. On randomized worlds is where you will find the resources required to upgrade your weapons and scans to sell. The scans will be sold at space stations, where you can upgrade your ship. How did the look of the game start and develop? 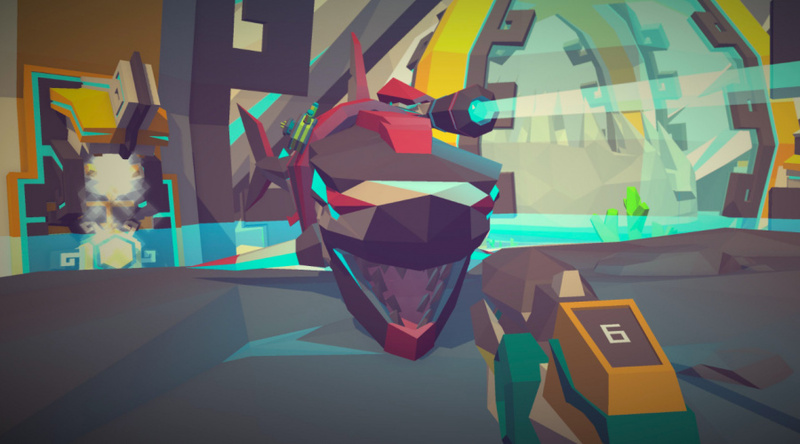 Josh Pressesien: A few years ago we created a game called Paper Monsters that had a low-poly look. It has sort of evolved into a more stylized aesthetic; more colourful, but less textures. It ends up having a more cinematic feel to it. How did the environments and inhabitants get selected and incorporated? Josh Pressesien: As far as the random worlds go, we separate everything by temperature range of planets. We decide which types of creatures, plants, trees, and rocks will show up in the various temperature ranges. These entities all have variations, so that if you go to another world in the same temperature range, you'll see a variation of that creature or plant. Some biomes have more content than others, but we are still continuously adding new things to find! Do the environment or inhabitants affect the gameplay? Ben Lee: Yes, the environments can be quite harsh and sometimes require certain suit upgrades. Likewise the inhabitants can be aggressive in many circumstances and will require either evasion or combat! The Nintendo Switch is able to be used as a home console on a big screen as well as portable. How is the transition handled in Morphite? Ben Lee: For Morphite the transition between home and portable is seamless. The game is also available on iOS and game consoles, so it looks and plays amazing in all configurations. Do you think the style of the gameplay shown in Morphite caters for both? Ben Lee: Considering that it's an adventure exploration game, I feel that the pace of means it can be enjoyed in both formats. It is possible for the player to become lost in the world of Morphite at home or out and about. Have the Switch's other unique features been experimented with? Ben Lee: We are experimenting with the motion controls. On the Wii U we had implemented them in another game, but on the Switch without the sensor bar it’s a little harder to get it nice. "Nintendo Wwitch" lol epic typo. Never heard of this before. I can see the NMS comparisons but this seems to be much more story focused and have more going on. I've never played NMS but Sony was hyping it for years so hard to miss. Looking forward to the release and a review. I'll go from there. Looks interesting. I will keep an eye on it. I did not about this game before now. Looking foward to playing it! If their release date happens to slide into early 2018, I think it might be for the better. This last quarter of 2017 is looking pretty crowded for the Switch. Been waiting for this game since it was announced. WAIT that is a FRICKIN SHARK WITH A FRICKING LAZER BEAM ATTACHED TO ITS HEAD! Pity the 21st Sept release date didn't stick for switch while it did for all other platforms I will be excited when this releases but October and November are very busy with releases so this won't be stick out as much as sept. This game looks quite good and hope it doesn't get lost in a sea of upcoming releases. @Bunkerneath It also appears to be flying. Wow, this looks like a fun indie game. Looking forward to Switch release information. @Jaxad0127 Inspired by AVGN much? Morphite and Golf Story were my most anticipated September games. Morphite bite the dust and Golf Story still doesn't have a release date. Sighs! Im still buying both but Im getting desperate. @JJ286 Yeah I'm waiting with bated breath for Golf Story any moment now. Hmm I will be keeping a look out for this. @brunojenso Seriously, Golf Story, Hollow Knight and Stardew Valley has take way too much time. Not to mention Yookay-Laylee. Wait - this is coming next week? @JJ286 Yup - agree with all of these - waiting to buy them all. I caved in with Hollow Knight and got it on Steam though - I couldn't handle the wait any longer. We needed games like RiME and Yookay-Laylee way back in April. I'm glad they'll receive extra polish now but man, I needed another big 3D adventure waaaay earlier. They really didn't explain how it's different from No Man's Sky. Not that I care, I have nothing against No Man's Sky. "Not just No Man's Sky on Switch"
Of course not. Nintendo games work. I like some of Crescent Moon's work on mobile, but this looks another level. Really hoping for the best, but my main concern is enemy AI and diversity. Some of their other games have had nice feel and mechanics but were let down by very basic enemy encounters. Anyway, I hope it evokes Turok and/or Unreal the most. Far from the best FPS, even of their time, there has always been something alluring about the exploration and isolation of those games that could do wonders for Morphite. Also, please come through with the motion controls. It will be worth the effort and give the Switch version a nice bullet point for those of us fed up with the imprecision and forced auto aim of dual analog. Proudly support team never auto. "compared to No Man's Sky for its striking, low-poly visual style"
No Man's Sky doesn't have a low-poly visual style. This is a silly statement. Actually this reminded me of a DSi e-shop title called X-SCAPE which in my opinion was one of the better DSi e-shop titles it was published by Nintendo I always hoped they would make a sequel on the 3DS it would be awesome to play a title like X-SCAPE in stereoscopic 3D. It's a shame that any game has to be compared to that overrated, over-hyped, outright misleading atrocity of a game that was No Man's Sky. Hopefully this delivers on what it promises at launch, unlike NMS. This was one of three indie games i was supposed to grab this month alongside Xenoverse 2 and One Piece. Guess it will just be Thumbleweed Park and Golf Story (if it actually releases this month) for now. I'd like to know if it runs at 60fps on Switch. I'll be getting the game no matter what, but if it is slow on Switch, I'll go for the PS4 version. Might be one of the indies I don't blindly day-one lol, just looks a little floaty to me. I think it looks really cool, it just might be too floaty for my tastes. Should I say the word "floaty" one more time? Floaty. The word has lost all meaning. Is this a joke? This game looks like Starfox 64. @shani Low poly stylistic choice similar to voxel or pixel graphics. These styles have been trendy for a lot of reason (nostalgia, artistic, etc) but the primary driving force is that these are small teams that simply cannot compete against the incredibly bloated costs of modern art teams. It's much better to do these clean, stylistic visuals than it is to do 3D graphics that look bad, because of how terrible modern 3D visuals age. Look at 3D game that's 5 years old and often you won't realize how terrible it looked. This also gives these small teams the chance to put their interesting, creative, and relatively risky ideas into the gaming world. @frogopus I highly disagree, there are games with 3D graphics that are even older than 5 years and still look decent. Still, even if you were right in some cases, 5 years are a lot in the IT business, so there really is no shame in a game looking outdated after 5 years. Besides, you're suggesting that - out of fear of their games looking outdated 5 years in the future - indie developers should instead produce games that look outdated on their release date? Come on man, that is totally illogical! Also, providing decent 3D graphics isn't as costly as you think. Nowadays there actually are a lot of free tools out there for game developers. These low-poly style of graphic is more suitable for VR. A lot of VR games especially mobile VR uses this type of graphic. @shani I know the cost of high end 3D graphics. Here's a good read from Steve Theodore, who worked on art for a bunch of early Valve games like TFC, Counterstrike, etc and Halo 3. He describes spot on both what we see happening here, describes the issue of costs, and touches on some of the very real issues within the industry right now (a lack of creativity due to the complete loss of our mid-tier development studios and risk aversion from the AAA's because of the huge financial investment). "A lot of the initial impetus for what we now call “indie games” came from disillusioned developers who were tired of being #211 out of 373 on a huge production floor and wanted to have some ownership over their games, even if that meant <rolls eyes> pixel platformers </eye roll>." There are lots of free options for making 3D art. But the cost of the software isn't the issue. Theodore describes how a single model he made in 1997 took 2 working weeks. In 2007 a model took him 7. It's now 2017. A single model costs a studio thousands of dollars in payroll and is handled by a dozen employees. It would cost an indie studio hundreds of hours of development time. That's time without a paycheck. That's time away from family, in between a 9-5 to pay the bills. And making a full game at that pace (not that it would happen) means that by release, you're already outdated by the time you release. It simply doesn't happen and these are the actual realities in the industry right now. You're chained to a desk with minimal impact on the game itself or you and maybe a small team work on a project that can actually be finished and released in a reasonable development cycle. ...wait, who thought this was comparable to No Man's Sky? No Man's Sky didn't have "Low-Poly Visuals", nor does this seem to be a "romp around the universe for no good reason outside of sheer self-motivated curiousity and individual goals" type of game, a-la Elite. This looks a lot more like Ratchet & Clank or Metroid Prime - which I see even the dev name-drops. I mean, I'm glad the dev went out of their way to answer questions and tell us more about the game, but I'm just sort of amazed at how people can pull these sort of statements out of their bumhole and still get taken seriously. The initial trailer and press release were enough to debunk the No Man's Sky comparisons, at least in terms of what was actually unique to that game, and not just increasingly prevelent trends that space exploration games are incorporating (not just Indie games, either. Even games like Mass Effect: Andromeda is arguably more similar considering what they've said here and before). Whatever, this game does look interesting, although I'll have to look for extended footage after it's out, since I honestly hate the low-poly look. At least in first person, since I find that everything sort of blends together, and it becomes increasingly difficult to tell what I'm looking at as things progress. Not exactly something you want when something can pop out and kill you at a moment's notice. I'd be interested to hear what that one issue they discovered during development was... it sounds as if Nintendo already knew about it, and were likely working on a solution... perhaps it was the issue with framerate that a few games initially had that appears to have since been resolved.